Voilà Catering provides delicious and elegant finger foods, hors D’oeuvures, and made-to-order plated appetizers at Business Open House Events in Portland. Different than most caterers, Voilà Catering’s food for standing events all individually prepared on site by one of our professional chefs. For food quality, freshness, and to preserve the delicate presentation of hors d’ oeuvres, we do not offer drop-off service on plastic platters. 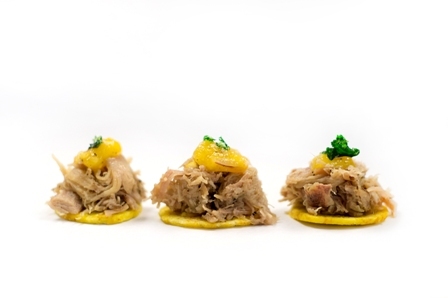 Visit our gallery of actual images of our hors d’oeuvres and small plates on our hors d’oeuvre image page. 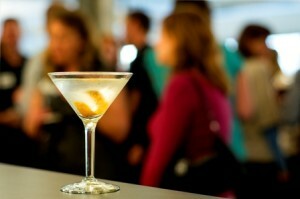 Business events are staffed by uniformed servers & bartenders, professional event managers, and white-coated chefs. The cost of service is based upon the number of hours service is provided and the number of servers. Voilà Catering does not have a required gratuity policy and as we pay our staff above standard industry wages, it is not expected. Voila Catering’s bartending service can provide beverages from range from our NW wines and micro brews to own non-alcoholic gourmet infusions and elegant cocktails. Our NW west wines are sold based upon consumption and start at only $9.25 per bottle with Northwest Microbeers at only $2.75 per bottle consumed. There is no minimum and beverage service includes pre-chilling beverages, ice, elegant display, and off-site recycling of empty containers. Naturally, we have $1 Million in liquor liability insurance for everyone’s protection and carefully follow all OLCC laws and rules for responsible service. Voilà Catering provides reliable and professional event management of your next business party including all the event rentals. Our professionals will arrange table, chair, glassware, linen, stage, and AV rentals and manage the set-up and tear down of your event minimizing the impact on your company’s staff before and during the event and allowing them to focus on your guests and customers.